Just announced: you can drive on the motorway with your fully qualified driving instructor from the 4th of June 2018. Theory test - are you ready (1) ? It's all very well looking at lots of multiple choice questions, but do you really know your triangular signs from your round ones? Or your stopping distances in the wet and dry? What is "kickdown" used for in an automatic car? "Kickdown" makes an automatic car accelerate (speed up) as quickly as possible, by forcing it to select a lower gear. It is enabled by pressing the gas pedal (accelerator pedal) down quickly and hard. Automatic cars normally select high gears to save fuel and wear and tear. High gears give poor acceleration. To accelerate quickly - for example to overtake - kickdown! What is a Statutory Off Road Notice (SORN)? It's a declaration that your car isn't being used on the road - so you don't have to pay vehicle tax. Your SORN is automatically cancelled when you tax your vehicle again or it’s sold, scrapped or permanently exported. 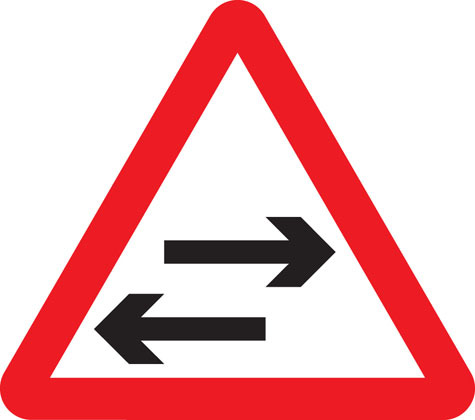 What do these two road signs mean? The first sign means "No Waiting" - it's the same as yellow lines along the side of the road. You can stop but only for long enough to drop a passenger off. This is normally found in urban areas. The second sign means "No Stopping" and is also called a "Clearway." You can only stop for traffic jams, breakdowns, accidents or if the police tell you to. This is usually found on bigger, faster roads. 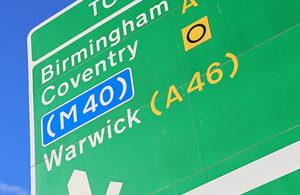 A motorway is always a clearway. How much room should you leave between your car and the car in front of you? Normally you should leave the stopping distance for the speed you are moving at. On a fast road a two second gap may be enough. Remember, in the wet stopping distances are doubled, and it can take up to ten times longer to stop on snow and ice. What is the legal minimum depth of tread for car tyres? 1.6 mm (one point six millimetres - about the thickness of a matchstick). The tread stops the car skidding on water (aquaplaning). At night, which side of the road can you park on? At night, you must park on the left, unless parking on a one way street, or in a recognised marked parking space. Why? It's possible that drivers might think you are parked on the left, and try to pass you on the right - and go off the road! If the overhead signs show a red cross over every lane on a motorway what action should you take? How far back should you place a warning triangle from a broken down car? At least 45 metres. Never use your warning triangle on a motorway - it's too dangerous. You break down on a motorway, and you have your dog in the car with you. Where should the dog wait while you are waiting for the breakdown service - in the car or outside with you in a safe place? In the car. It's the law (unless there is immediate danger - e.g. the car is on fire). The driver and any passengers should wait in a safe place on the hard shoulder well away from traffic. What does "Third party" insurance cover? Other people and their property. Not your own vehicle or property - fully comprehensive insurance is needed for that. You want to turn right at the end of a one way street. Which lane should you position your car in? At what age does your car require it's first MOT certificate? Three years. After that it's every year. When parking at night when must you leave your parking lights (side lights) on? When parking on any road where the speed limit is greater than 30 mph. Why are these two road signs a different shape to all the others? "Stop" and "Give Way" are the two most important signs. If these signs are covered in snow you can still identify them from their unique shape. What do two solid unbroken white lines in the centre of the road mean? You must not cross the line nearest to you. Your insurance has a £250 excess. What does this mean? You will have to pay the first £250 of any claim. You are following a horse rider, who is approaching a roundabout. They are in the left lane. Which direction should you expect them to go at the roundabout? A horse rider (or a cyclist) might use the left lane to turn right at a roundabout. It is sometimes too dangerous for them to use the right lane, as they cannot go as fast as other traffic. From From 1 October 2015, private vehicles must be smokefree if they are enclosed, there is more than one person present and one of them is under 18. So it will be an offence: for a person of any age to smoke in a private vehicle that is carrying someone who is under 18 for a driver (including a provisional driver) not to stop someone smoking in these circumstances The rules don’t apply to e-cigarettes." From the 8th of June 2015 the paper counterpart to your driving licence is no longer valid. After this date, you only need to keep the photocard part of your licence. (Note - some people haven't updated to the new photo card licence and still hold the older paper licence. Do not destroy this - it is still valid). You will need your licence number, national insurance number, and the postcode on your licence to use this service. If you live in Hampshire (excluding Southampton, Portsmouth and the IOW), and are aged btween 17 and 24, you can receive £75 towards the cost of Pass Plus from Hampshire County Council. Go to the HCC Pass Plus website to find out more and apply for your £75 reduction. Download this useful guide to traffic signs. If your practical driving test is cancelled by the DSA with less than three working days notice, you may be able to claim for your expenses. You can ask for the form at your driving test centre. The first time it happens is always a surprise - this video is an excellent guide to dealing with blue lights. Who better than Martin Lewis to collect together all the best advice and tips for saving money on your car insurance? Independent driving was introduced to the driving test in October 2010. For this, the candidate has to follow signs, instead of being given specific directions by the examiner. At the time, there was a lot of worry and uncertainty. I thought I'd put a spoof video online (I used an anonymous account). All my own work, except for the clip from the film "Downfall," of course. Be careful when you book your theory test. There are rogue sites out there which will book your theory test, and charge you more than the correct fee. The theory test can be booked at the official site, and currently costs £25.00. Some sites will charge much more - typically £60.00 - for exactly the same service. (Incidentally, there are similar scams when applying for driving licences, passports, and European health cards).